Vermont Soap Products are Certified Organic by VOF a Division of NOFA-VT! When we tell our customers we are now making USDA Certified Organic Soaps, they often reply, “I thought your stuff was always Organic!” The answer is, we have always used top quality natural and Organic ingredients. Organic Certification makes it official. Click here to view our organic certificate. The USDA organic program is the gold standard of natural world-wide. Certified Organic MEANS audited natural from farm to bottle. The process started back in June, 2003, when our factory became certified as an Organic Processor. This involved demonstrating an understanding of USDA Organic Regulations, and developing a system to separate Organic raw materials, work in progress and finished goods from non-certified raw materials, work in progress and finished goods. All finished labeling must be approved for compliance with Organic Labeling Standards. A great working relationship with our Certifiers; North East Organic Farmers (NOFA) and Vermont Organic Farmers (VOF), made the process significantly less painful than it might have been. As this is being written (October 2003), virtually everything we manufacture carries USDA Organic Certification. 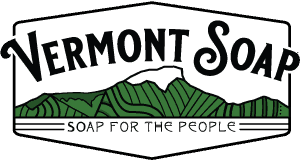 As we sell through our inventory, we are releasing our new line titled Vermont Soap Organics. We expect our transition to be complete in January 2004. Did you know that a product can make an Organic claim, yet only contain 70% Organic ingredients? The other 30% must come from an approved list of nontoxic ingredients. Problem is, industry groups and USDA are still deciding exactly what the rules for personal care are going to be. This process will take several years at a minimum. Vermont Soap USDA Organic means our products are made with a minimum of 70% Certified Organic ingredients. Alkali, used to turn oils into soap, and water are the primary non-organic ingredients. Virtually every component comes from plant based renewable resources, farmed and processed without chemicals, in a sustainable, fair trade manner. Our main base oil supplier (palm, coconut, olive and palm kernel oils ) sets aside 3 hectares for every hectare they plant on their farms in Brazil. We use both natural and certified organic essential oils, grains, and herbs. We will NEVER count the water as the Organic ingredient. Our goal, and the reason for this company’s existence, is to provide you – the awake consumer – with affordable alternatives to the current petrochemical based personal care products industry. It is our hope and dream, that our civilization will evolve quickly into a sustainable, peaceful and modestly prosperous world society. Our long term viability as a species depends on it.